AIS mobile data packages have been compiled here, and are updated regularly. AIS has nationwide 3G and 4G coverage. Check all coverage areas. 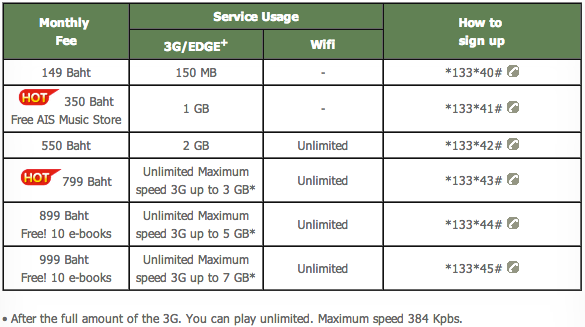 Choose a data plan below. Enter the USSD code of the plan into your phone and dial. You will get an SMS confirmation when signup for the plan is complete and your credit is deducted. To get AIS Wifi Password dial *388# to get a username / password via SMS. DTAC Happy mobile data packages have been listed here, and are updated regularly. DTAC Happy has nationwide 3G and 4G coverage. Check all coverage areas. True Move and True Move H mobile data packages have been listed here, and are updated regularly.True Move H has nationwide 3G and 4G coverage. Check all coverage areas.